Endress+Hauser‘s sales activities for eastern France will be brought together with the European sales department of Kaiser Optical Systems (a company set up in Lyon in 1998 with the help of Aderly – Invest in Lyon) at a new 1,500 sq. m. building set to open in January 2017. Endress+Hauser, a specialist in measurement instruments, services and engineering solutions, acquired Raman instruments manufacturer Kaiser Optical Systems in 2013. 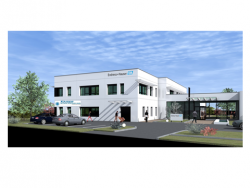 Incorporating the European sales office in the new campus being built in Saint-Priest, near Lyon, is a further step in integrating the company. Currently located at an office in Bron, just outside Lyon, the 25 Endress+Hauser employees will move into the new building designed based on high energy performance standards and using environmentally friendly materials. They will be joined by the 9 Kaiser Optical Systems employees today based in nearby Ecully. Customers in the life sciences, chemicals, environment, food and oil and gas sectors will thus benefit from the synergy created by bringing the two organizations together. The 7,000 sq. m. site is located in Saint-Priest in a fast-growing business zone near Bron airport. The first building includes offices, a storage facility, and a demonstration and training area for customers. Construction work officially began with a groundbreaking ceremony on 20 June 2016 and is expected to be completed in January 2017. In the future, other Endress+Hauser Group activities could be brought to the facility, a further development project in the Lyon area that will be made easier thanks to support from Aderly. The Endress+Hauser Group, active worldwide, today employs 13,000 people, with sales of over €2.1 billion in 2015. Founded in 1953 by Georg H. Endress and Ludwig Hauser, the company – originally specialized in level measurement – became a provider of end-to-end metrology and industrial automation solutions.